At the District 4 Conference in September 2009 the membership voted to assemble and distribute birthing kits. Birthing kits provide the essential items to promote a safe, clean delivery and to encourage good aftercare. Zonta Club of Jamestown has sent over 2,000 kits to places like Haiti, Honduras, Africa, Afghanistan, Nepal and Guatamala. What is in a birthing kit? JAMESTOWN: Zonta Club of Jamestown recently heard first hand, how their birthing kits helped to decrease home birth risk factors in Haiti thanks to a special presentation from Mary Rappole, Zonta Club member and retired Women’s Health Nurse Practitioner, and her husband Dr Bert Rappole, retired surgeon. Both are local to the area. In the year 2000, Mary first traveled to Haiti. Following that trip the Rappoles, with other community members, created Alleghany Region Missions (ARM) a non-for profit Christian missionary organization. Haiti has a population of over 11 million. Lack of education and access to safe medical care are two of the primary deficits that ARM has been attempting to improve. Only 50% of all children are in school and a mere 2% actually finish secondary school. ARM coordinates their services with existing non-governmental organizations in the country such as Village of Hope and Servants in Fellowship (SIF). In May 2017, the Rappoles traveled with SIF as team leaders. Bert one of 5 providers and Mary working with the pharmacy team. For one week they were able to provide outpatient medical care and treatment needs to over 750 men, women and children. At the clinic, Mary was able to distribute birthing kits from Zonta Club of Jamestown. The birthing kit project began over ten years ago in a Zonta Club in Australia. Since then it’s grown across the globe with Jamestown taking on the project about 7 years ago and sending kits to places like South Africa, Nepal, Haiti, Honduras and Afghanistan. Contained in the kit is a 3X3ft sheet of clean plastic, a pair of latex-free gloves, three umbilical cord ties, small bar of soap, gauze and a new razor blade. The purpose of the kit is to provide a clean area and clean birthing tools to lessen the chance of a birth-related infection of mother and of baby during the birthing process. 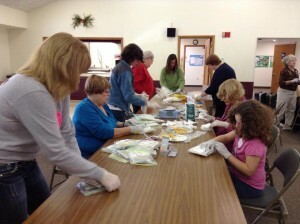 The Jamestown club had learned from a Pittsburgh Zonta Club how to assemble in a clean environment and the correct tools to use for the kits. These kits cost less than $1 to produce and can save mother and baby from suffering infant or maternal infection and/or mortality. Maternal Mortality is defined as death within 42 days of completion of pregnancy. Infant Mortality is defined as death within first year of life. The World Health Organization (WHO) reports that there are 6 key principles that can decrease infant and maternal mortality: clean hands of the birth attendant, clean perineum, clean surface for delivery, umbilical cord care (meaning both cord ties and razor are new and clean), and teaching the mother to not apply native salves to the cord. In the United States, the maternal mortality rate is 28 deaths out of 100,000 pregnancy terminations (full term pregnancy and elective abortions), with 98.5 births attended by a skilled staff and only 1.5 births unattended. 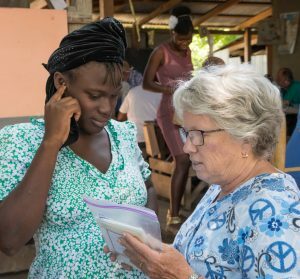 In Haiti, maternal mortality rates are 359 deaths per 100,000 pregnancy terminations with only 48.6 births attended by a MD, RN, midwife or a TBA (trained birth attendant) over 50% of births have none of the above. Within the 28 deaths out of 100,000 pregnancy terminations in the US, there is also disparity between black women at 11.3 of the 28 and white women 4.9 of the 28. Causes for maternal mortality in the US are typically due to embolism, hemorrhage, eclampsia, infection and cardiac pathology. The causes for maternal mortality in Haiti are very different: bleeding, sepsis, eclampsia, obstructed labor and an unsafe abortion. Now lets look at the other half of that equation, infant mortality data: Infant mortality in US 5.9 per 1,000, and causes are birth defects, preterm delivery, Sudden Infant Death Syndrome, injuries and maternal complications. Infant mortality in Haiti is 59 of 1000 births, 10x that of the US, of which 1/3 die in the first week, and 53% in the first 4 weeks. The cause of infant death in Haiti is very different then in the US; tetanus, diarrhea, respiratory infections, malaria, TB and HIV – which are all preventable. After presenting these statistics to Zonta club during the recent program, Mary and Bert then screened a film produced by ARM featuring the clinic: Bert assessing and treating children and adults and Mary teaching a woman about clean birthing practices and how to use the kit provided by the Zonta Club. Mary compared the cost of a Zonta Club Birthing Kit (est. $1) to a kit made for a woman in the US to birth at home (est. $36) which included; baby hat, bulb syringe, gloves, cord clamps or tape, lubricating jelly, antiseptic cleansing agent, plastic sheet, gauge pads, alcohol pads, tape measure, plus any additional needs or wants. At the conclusion of the presentation for Zonta Club of Jamestown, Mary and Bert Rappole received voluminous applause and requests to share their video from ARM. The video can be viewed on the Zonta Club webpage at zontajamestown.org/birthing-kits. The Zonta International Club in Jamestown assembled 480 birthing kits that will be sent to third world countries to be used in obstetrical settings providing improved birthing practices for women and infants. The kits were assembled at St. Timothy Church Route 430 in Bemus Point by volunteers of the Zonta Club using a “clean technique”. 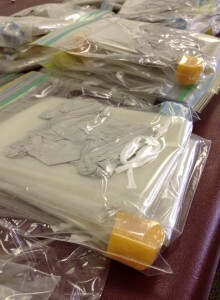 The birthing kit contains a 3X3 foot sheet of new plastic, a pair of disposable clean gloves, a small cake of soap, three cotton umbilical cord ties, gauze pads, and a new disposable razor blade. The plastic sheet provides a clean area for the delivery of the infant, gloves provide another aseptic barrier protecting the newborn from bacteria exposure, and of course the soap is used for the new mom, newborn and those helping with the delivery. All items are donated or purchased by Zonta International Club of Jamestown with Service funds from the local budget. Thus far, 100’s of the Jamestown club’s birthing kits have been sent to Haiti, Honduras, Afghanistan, Nepal and points East in Africa. A midwife in Honduras has benefitted from the kits for several years. The Zonta Club has outfitted her practice with surgical scissors and other products for sterilizing the implements that may be used. This initiative is now a Zonta International District 4 project, first introduced by a Zonta Club in Australia. District 4 has sent over 10,000 kits to third world countries. The birthing kits are an effort to reduce infection in the mother and baby with a goal to reduce infant and maternal mortality. would be happily accepted and greatly appreciated!